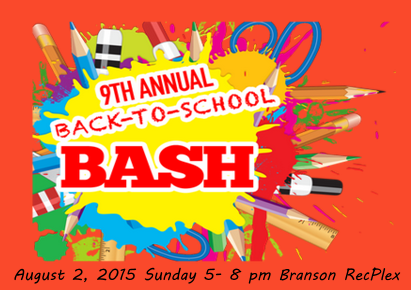 FBC Branson will host the 9th Annual Back-to-School Bash at the Branson Rec-Plex Park on August 2 – Sunday from 5 – 8 p.m. – Everything is FREE! Swimming, Hot dogs, drink, popsicle, inflatables, climbing walls, games, face painting, eye exams, fire trucks + free new backpack & school supplies, frisbees. *Note: Kids must be present to get the backpack & supplies. Over 200 volunteers will provide a safe and fun time for everyone. Swimming is in 3 time slots. (5, 6 & 7 p.m.) *Only 600 allowed in pool at one time. Swimmers must have swimsuits based on Taney County Health Laws. Everyone will check in at the registration tent and then receive a “Backpack Card” (while supplies last) – Their are no requirements at registration but a simple registration form is filled out with name and address. The backpack card allows everyone to decide when to go inside the Rec Plex gym to pick up their backpack and supplies. Security is provided by volunteers and by Taney County Sheriffs. There will be 1750 backpacks and sets of supplies to be given away. The only restriction is that someone who registers is from Taney or Stone county. At the event will be plenty of non-profit organizations for people to find out what services are available in the community. All giveaway items are limited to supplies. <*First come, first serve. Chick-fil-A, Titanic, KRZK 106.3 FM, Coldstone, Ozark Mountain Ear, Nose & Throat, Branson Bank, First Community Bank, MERCY, The Six Show, IMAX, Chateau on the Lake Resort, Lilley’s Landing, MFA Propane, White River Valley Electric COOP, Price Chopper, Mr. IceMan, Branson Tri-Lakes News, Jim Lawson, KLFC 88.1 FM, Branson Daily Independent News, Taney County Times, Monkey Moes Inflatables, Pearle Vision. National champions from multiple major youth baseball organizations will be coming to Branson this summer to compete in a tournament of champions. The 2015 12U Champions from AABC, AAU, CABA, Dizzy Dean and NABF will be competing in the Youth Baseball Network (YBN) National Championship. The tournament will be held August 19-22. The inaugural YBN Championship will be played at the Branson RecPlex, with future Championships played annually at the new Ballparks of America in Branson. In addition to the participating champions, a host Branson-area All-Star team will round-out the six team tournament. Youth Baseball Network is planning for additional major youth baseball organizations to join the YBN Championship in 2016. Youth Baseball Network, a marketing and online media company, developed its YBN National Championship by partnering with many of the largest youth baseball organizations in America. This invitational tournament promises to become the preeminent national youth baseball championship in the country. The YBN Championship begins Wednesday morning, August 19, at 9:00 AM. 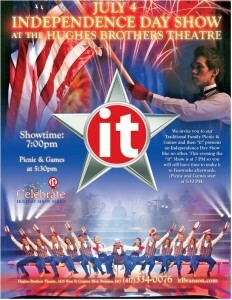 A special Opening Ceremony will take place that day at 6:30 PM at Branson Landing. The ceremony will feature Missouri State University Head Baseball Coach Keith Guttin as Guest Speaker. Coach Guttin, a member of the Missouri Sports Hall of Fame, was recently named the 2015 Missouri Valley Conference Coach of the Year – an award he has won five times. Coach Guttin will host a question and answer segment and discuss his experiences in baseball. Additional entertainment at the ceremony will be provided by Branson’s popular ‘Buckets N Boards.’ Matt Levingston and Gareth Sever have crafted a hilarious and high-energy show chock-full of precise percussion, ridiculous songs, spectacular tap dancing, inventive instrumentation and unique musical talent. The teams will arrive at the Landing via Branson’s famous amphibious craft that resemble the WWII DUKW, courtesy of Ride The Ducks. Games continue at the RecPlex Thursday and Friday afternoon, with the YBN Championship Finals scheduled for Saturday at 3:00 PM. The Finals will be preceded by a Home Run Derby contest at 1:30 PM. The full YBN Championship schedule can be seen at www.youthbaseballnetwork.com. Thursday July 23, 2015. 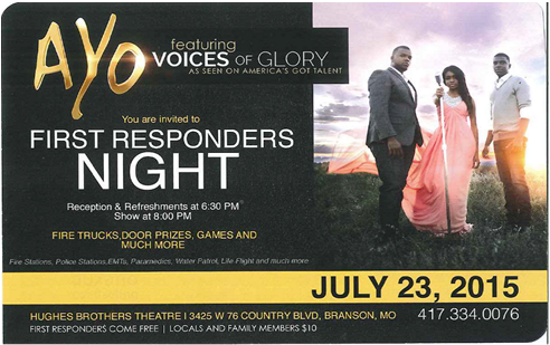 AYO Featuring Voices of Glory will host a special show honoring first responders! Reception & Refreshments at 6:30 pm, Show begins at 8:00 pm. Fire trucks, door prizes, games and much more! First Responders are admitted for free, locals and family members of first responders are only $10 each. First Responders to include fire stations, police stations, EMTs, paramedics, water patrol, life flight, and much more. 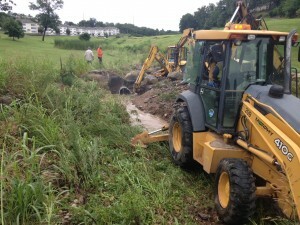 Overnight flooding has caused a 36-inch sewer main pipe to fracture. Utilities Department crews are on the scene now, and have restored sewer flow back into the pipe, stopping all sewer flow from entering the creek. The pipe lies within Wildwood Creek in the Thousand Hills Subdivision area. “The main fractured sometime during the overnight storm” said Utilities Director Mike Ray. “For a few hours, approximately 75% of the volume of the main was discharged into the creek. Fortunately, the volume of water flowing through the creek has heavily diluted the spill.” Wildwood Creek flows into Cooper Creek and then into Lake Taneycomo. As a precaution, the Cliff Drive Water Treatment plant, which is located downstream from the break, has been taken off-line. The city’s other water treatment facility, the Meadow’s Water Treatment Plant, draws water from Lake Taneycomo upstream of the discharge from Cooper Creek. The City has been in communication with Missouri Department of Natural Resources representatives, who are providing guidance for appropriate containment and cleanup. Due to the heavy rains overnight, parts of Stockstill Park will be closed down until the Roark Creek subsides. Click below for more information. 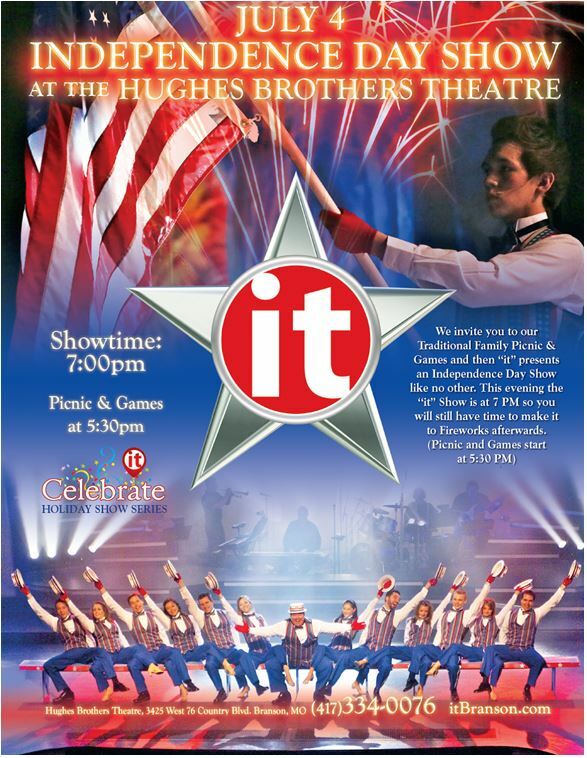 Join the Hughes Brothers as they celebrate Independence day! Show at 7 pm. Picnic & Games start at 5:30 pm. Click the flyer below for more information. Celebrate Our Nation’s Independence with Area Firework Displays! Free concert at 8pm with fireworks following. Free with purchase of Shepherd of the Hills Outdoor Play – Fireworks after the show. 7:00 pm – Bull Riding, followed by a concert with Billy Dean & The Steel horses, ending with Fireworks. Adults-$49.95 | Children (4-12 yrs old)-$24.95 | Kids under 3 are free. Backyard BBQ from 5pm to 8pm with live music. Adults-$26 | Kids ages 4 to 12-$12 | Under 3 is free. Fireworks after dark. Kimberling City, MO – 76 West to Branson West, then 13 South to Kimberling City. 3rd Annual Little Miss Firecracker Pageant, Fireworks at dark. Hwy 65 business south to Hollister. Vendors and Food Concession begin at 12pm, Games in the park and dunking booth at 3pm, Fireworks around 9pm.